Single Tanks model with or without stainless bands to fit 6.9” diameter tanks. Taken directly from an original sample, this reproduction harness is the closest available for the vintage diver today. The harness can be made on your bands or can be purchased with new, stainless steel bands from us. Each one is custom made from your measurements. The harness is available in almost any color, including the traditional US Divers Blue or Voit green. Included with the harness are instructions for attaching to your 6.9 inch diameter tank, proper use and care. Of all harnesses made for double tanks, the simple cotton harness has proven to be the best in comfort and use. This harness was used beyond the cotton days as the US Navy based their “military” model on this harness. We have bands for this model. Available in custom sizing and your choice of colors. A new model available from A & D Adventures, LLC. After careful research we are now able to reproduce the well known cotton harness in a Sea Hunt version. Dark green in color, the D-rings are riveted as the originals. What makes the Sea Hunt model different is that the shoulder reinforcement (padding) is sewn, not riveted like the US Divers Navy Blue model. A & D Adventures, LLC’s Sea Hunt model is available in single, double and triple tank styles. One of the major contributors to VDH has developed a way to fabricate the manifold and bands for triple tanks. Triple tanks were very common in the 1950s. The harness reproduced by A & D Adventures, LLC for these tanks is copied from another original in excellent condition. The harness attaches to the tank bands by way of eye bolts which are NOT included in the price. You may provide them or A & D Adventures, LLC can supply them at additional cost. This harness from A & D Adventures, LLC is an excellent reproduction of a harness used by US Divers in the mid 1950s. Constructed of cotton webbing, the harness fits a specific tank like a basket. Easily removed, it is however made for one specific tank size. They are commonly made for steel 71.2 tanks, however we have custom made them for cylinders as small as 19 cu ft to Al 80s. They fit one cylinder-size only however and are also less adjustable for diver’s fit. Careful measurements must be taken to assure that this harness fits you correctly. Please contact A & D Adventures, LLC prior to ordering. Newly designed, this travel harness combines the best of two worlds. Made in the vintage style of cotton harness materials and modern cam-action tank bands, this harness will fit most cylinder diameters. You can now travel conveniently with your vintage harness and use the cylinders available at your dive destination. Made with the same quality as our other vintage harnesses, the travel harness is available in most colors. Constructed of original style materials, the hookah harness was reproduced with the assistance of numerous vintage diver historians. It is made to fit the DA Aquamaster, Royal Aquamaster or Voit Navy with Hookah ports exactly like originals. It is available in USD blue or other colors. 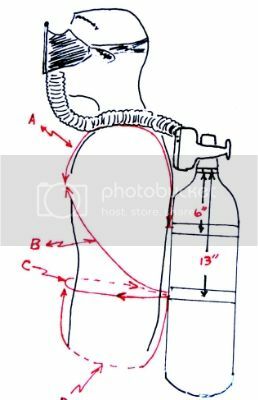 To take your measurements, follow these directions: First, sit your tank (any tank will work as it is the regulator position to you that is important) on a table or counter so that you can stand with your back close to it. Put your regulator on the tank. Make two marks on the tank. One will be 6″ down from the base of the valve (top of tank at top of neck). The other is 13 inches down from the same beginning point. These marks indicate the center of your two bands when placed on the tank. You measure along a line that is parallel to the cylinder wall, do not follow the neck. Measure from the tank/valve junction. The marks will be in a line that is directly below the valve opening, i.e., in the center of your back when worn. These measurements are not engraved in stone, but give me some idea as to your sizing. The harnesses by their inherent nature allow for much adjustment. Also the 6″ and 13″ marks are approximate. Once the harness is done, you can move the bands up and down the cylinder. See the photo of how to place the marks. Stand with your back to the tank and the tank as close to your body as possible. Position the regulator body as seen in the diagram, i.e., between your shoulder blades. (That is the proper position for optimum breathability and comfort.) Use the attached diagram to aid in making your measurements. Normal time for harness is 2 days from order to shipping. I will need your mailing address to complete the order. I make up the harness based on your measurements and color choice and then will invoice you with the total. Cost to ship is determined by your location. I send the harness via USPS Priority to provide a tracking number. Most orders are received within 2 or 3 days of my shipping. I enclose all instructions as to how to attach to tank and the proper way to adjust it to fit. Also I have a set of directions for the love and care of the harness. I stand behind my work, any problems; I will take care of them. If I can be of any further assistance or if you have any questions, please email. WEIGHTS FOR 2″ BELT. 1 1/2, 2, 3, 4 POUNDS. Thanks for such a great vintage site! I’ve spent the last several years slowly collecting some nice DH regs and Sea Hunt related equipment. I finally found two Voit period tanks and will turn them into a set of doubles with an old Voit manifold I found several years ago. So I will need a set of bands, harness (the Sea Hunt model, of course), etc. Can I get all of this from you? Can you source the bands, eye bolts, etc? The tanks are white painted with the blue Voit decals. They are fairly beat up and the last hydro was in ’98. They have had some air in them ever since. The USD J valves seem in good shape, but I won’t be using them for this project. I’m undecided about whether to have the tanks hydro-ed (if they would pass….) or just cosmetically improve them. I’m uncertain if I should strip the paint & leave them galvanized, repaint, or what. If you have any thoughts or advice, they would be appreciated! Also, do you know of anyone who could rebuild my old (3-61 stamped on it) Voit J double manifold? Or just buff it up cosmetically and call it good? I guess that goes to the question of trying to get these actually ready to dive or just use as part of a Sea Hunt display/collection.